Where better to get away from it all as the days draw in than a five-star cottage in south-east Cornwall, voted as one of the UK’s Best Coastal Holiday Cottages by The Sunday Times and the winner of a 2018 Certificate of Excellence from TripAdvisor? With plenty of space for two families to holiday together, either wrap up warm for a bracing walk in stunning scenery or uplifting sea views, or cosy up and keep toasty in front of the fire. Mainly on pavement and good and gentle, this pram-friendly walk is a breeze! Stroll around the Hoe, the Barbican and Mount Batten breakwater and enjoy the seaside views. 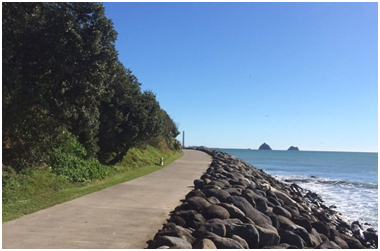 This unique section of the South West Coast Path is an entertaining and enlightening journey with plenty to learn along the route about the city’s history and heritage. Top Tip: you will find loos and a car park at Admiral’s Hard (postcode for sat navs PL1 3RJ) and refreshments dotted along the path. 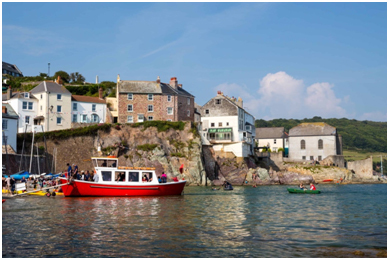 The Cawsand Ferry will take you from Cawsand Beach to the Barbican Landing Stage at Plymouth in half an hour. A 12 minute walk around the North Quay will take you to the National Marine Aquarium, Rope Walk, Coxside, Plymouth PL4 0LF – a great option for a rainy day. Top Tip: The NMA runs many exciting events for children which you can check out here. 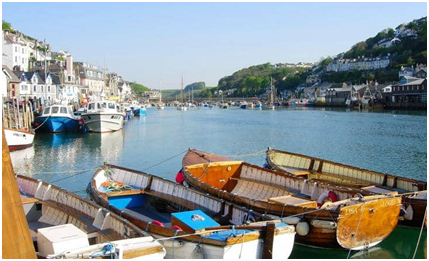 …will take you to the pretty harbour at Looe. There are boats to admire in the harbour, and a sandy beach close to the town centre so it’s easy to wander through the streets and find your way to one of the many cafés and restaurants. Take a trip to Looe Island, visit the Monkey Sanctuary or take a journey on the Looe Valley Railway. Top Tip: The Old Mill House in Polperro close by is a dog-friendly pub with a garden to sit in on a sunny day. We can’t ignore it – Christmas is around the corner! 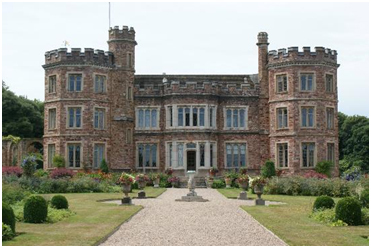 And around the corner from Blue Monkey is the beautiful Mount Edgecumbe House and Gardens, hosting their annual Christmas Fair 8-9 December 2018. Gifts, local produce, cookery demonstrations and more, along with traditional Christmas carols, will ease you into the festive spirit. Mount Edgecumbe estate also offers great pram-friendly walks, with spectacular views across Plymouth Sound and a host of eighteenth-century follies, fountains, seats and shelters for you and your pram to rest along the path. The route travels through the parkland and woodland of the historic family seat of the Earls of Edgecumbe, who built the house at the heart of the estate in the mid-sixteenth century. Top Tip: The house, gardens, tea-room, restaurant and shop are open to the public during the summer season but the South West Coast Path, passing through the estate, is open throughout the year.